Frontiers Music Srl is pleased to announce the signing of BULLETBOYS to the label for a new album to be released in the last part of 2016! 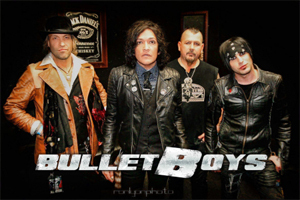 BULLETBOYS formed in 1988 at the very peak of the Los Angeles hard rock movement. With record companies constantly searching for new talent, they possessed a pedigree that most bands would kill for. Unlike the other rockers of the day, the BULLETBOYS were more hard rock and blues fusion than pure hair metal. Using their credentials, they were able to quickly capture the attention of music fans around the world while frontman Marq Torien emerged as one of the most underrated vocalists of the era. Thanks to comparisons to the likes of AEROSMITH and especially VAN HALEN, talent scouts came running and the band quickly received their first major label contract. With a debut album, produced by none other than Ted Templeman (VAN HALEN, MONTROSE) which sported the the smash hit single "Smooth Up in Ya", BULLETBOYS officially established themselves as the leaders of the then LA rock scene. Constant tours and the support of MTV soon brought the album to platinum status. Two more albums soon followed, Freakshow and Za-Za. The band continued to tour and release albums surviving throughout the grunge era and outlasting the nu-metal craze. With 8 more studio albums under their belt, BULLETBOYS are ready to start again with a new label, feeling stronger than ever!